Computers can be useful tools for consuming information, processing data, and a source of all kinds of trouble. All too often problems can keep computers from running as they should, and before long these problems can turn your PC from a powerful machine to a giant paperweight. Follow these helpful tips to make sure your computer keeps running smoothly for a long time. Nobody likes losing progress due to a power outage, but with with an Uninterruptible Power Supply, or UPS, you can limit any long-term damage to your computer. Any UPS comes with a built-in surge protector that protects against low voltage and high voltage influences during storms, and the UPS prevents computers from crashing due to power outages. This significantly limits the damage done to a computer during a power outage, and no computer should be without one. Whenever you remove a peripheral device while your computer is on, you risk shorting out the connector socket on the motherboard. If at all possible, make sure to unplug devices while your computer is off. Some peripherals can be plugged in and removed while your computer is powered on, or hot plugged, such as USB devices. If you know that the device you want to remove can be hot plugged, then you don’t have to worry about shorting out the motherboard. In spite of all the effort you can put into protecting your computer, it is always possible for something to go wrong. If something breaks, make sure you have the tools to fix it by keeping track of all system software and disks that come with peripherals. The last thing you want is to need drivers for your computer and not have an internet connection to access them; your drivers that come with your devices may not be the most up to date, but they’re functional and useful in a pinch. Windows isn’t the only thing that starts up when you turn on your computer. A host of other programs from printer software to music programs can launch when Windows starts, and the fewer programs that launch at startup the better. You can see a list of all programs running by pressing CTRL + ALT + DELETE, clicking on Start Task Manager, and looking at the lists under the Applications and Processes tabs. If something is running that you no you don’t need, feel free to shut it down, but make sure you don’t terminate any important system processes. It’s never too early to save a backup when working on an important project, but it can easily be too late. Make sure you don’t lose anything by saving copies of files to USB drives and CDs or DVDs as soon as possible since you never know what might happen. From here you can open both programs and perform the maintenance you need to clean up old files and reorganize your hard drive to make it more efficient. Remember to run both of these programs at least once a month to keep your computer in good shape. If you have a high-speed internet connection, a firewall is a vital piece of software that will keep you protected from hackers. Windows comes with a built in firewall with adjustable settings. From here, you can see whether or not your firewall is active and protecting your computer. Make sure either the Windows firewall is running or you have another program with a firewall running and protecting your computer. Even if your internet connection isn’t state of the art, it can still bring unwanted viruses to your computer. The best way to prevent this is by investing in antivirus software for your PC and making sure that it performs routine checks and updates virus definitions automatically. 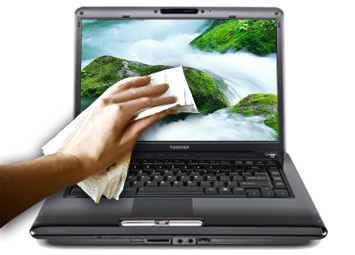 Don’t let new viruses catch your antivirus software off guard and harm your computer. From here you can click on the box in the middle that should say Install updates automatically (recommended). If it doesn’t, select that option and click OK to save your changes. Many Windows updates fix potential bugs and can keep your computer in good shape. The power button on your computer should be used to turn on your computer, but shutting down your computer with the power button can damage your hard drives over time. If possible, make sure you shut down Windows properly with these steps. Click on the Shut Down button. Your computer might freeze and become unresponsive, preventing you from properly shutting down your computer. By pressing CTRL+ALT+DELETE, you can access the Task Manager and try to close the unresponsive program and then try to shut down your PC properly. These tips and tricks will do wonders for your computer and keep it running smoothly. If you have any other ideas for PC maintenance, feel free to share them in the comments.